In two weeks children all over the country will be returning to school. 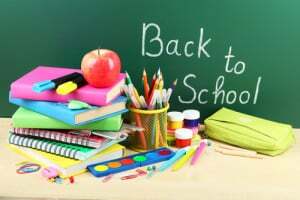 With summer break coming to an end we urge parents to bring their little ones in for a back to school visit. We can address any issues before the semester begins and for teens we can discuss ways to start school with a brighter smile. Once school starts, between homework and extracurricular activities finding time to see the dentist is often difficult. Instead of stressing, why not see the dentist before the semester begins? You can then schedule a follow up during winter break, seeing the dentist once every six months as the American Dental Association recommends. During the checkup we will look for signs of decay, gingivitis, or other issues that frequently arise with younger patients. In many cases, we can also treat the issue before the school year begins. For teens, we can also discuss cosmetic solutions to teeth stains. Teeth whitening can remove discoloration and brighten teeth by multiple shades. If you or your child would like to learn more about improving oral health and maintaining a beautiful smile, contact our office today. Remember, the new school year is right around the corner.